Can’t Throw Any Harder? Reached A Hard Velocity Limit? Contrary to some thought out there, every person will at some point reach a hard limit on velocity. 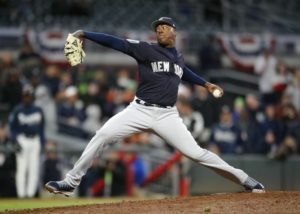 If everyone was capable of throwing 100mph, we all would, especially if it was PROVEN through correct training and immense hard work…there’s no magic bullet however contrary to the velocity business machine, that oversees the modern day pitching era. I won’t discredit the intense amount of hard work that comes along with reaching those high per hour for the ones who do, but that SAME amount of hard work can amount to a fraction of added miles per hour for any other given pitcher, or a hard cap on their peak number. Countless pitchers put in the time, dedication, and passion; fractions achieve there goal. Physiology and genetics may potentially play a role in capping your limits… What happens then? If you don’t throw hard enough, the next thing holding you back is mentality. Dealing with that fact, accepting it, and finding solutions. My goal isn’t to give hope to the soft tossers out there. If anything, I’m going to tell you exactly how HARD it is to have a career without velocity. It will undoubtedly be the hardest and most difficult route reaching your playing career goals than any other way. It’s not enough for me to tell you simply that lower speeds CAN compete at higher levels. Don’t be misled, that’s not a hope driver statement. Getting there in order to show that, is next to impossible. Yes, these stories exist as I have proven in a previous blog— but many evolved to that speed, from a higher velocity, and were able to prove success still is attainable without it. But they are few and far between, and in terms of percentages, you are looking at a less than 0% chance of reaching the MLB level with scouting culture the way it is, regardless of ANY velocity let alone “slow”. I understand this now, and I understood this as a young aspiring player in HS in the early 2000’s. Standing at 5’9 145 pounds as a left handed pitcher, I realized early on that it was going to be a long road of hard work to reach my goals. I was a passionate player, who worked hard. To show just how dedicated to the game I was, its important to note I switch hit, and could do it pretty well you could say even at 145 pounds (10 HS HR 4 RH 6 LH), which many may not notice listed on any of my player profile pages, and did that all through HS into college. I practiced hitting typically 2-3 hours a day (daily), and divided my attention equally to both sides of the plate. Mark Texeira also trained at the same facility growing up in local MD suburbs and we ironically played in the same HS private school league (Different years however Spalding and Saint Joe). He would hit endlessly it seemed, also dividing his time to both sides. Good culture. Blue collar work ethic. I was forced into full time pitcher only as a Freshman in college, it ended up being a wise move. The decision came easy for me, deducing although I was “faster” (6.8 60yds) I didn’t have the knack for centerfield, and while corner outfield positions and first base are typically occupied by the physically elite at the higher levels of the game, with that pitching became my primary focus, entering my senior season in HS. My focus in my training was never to prove doubters wrong (although it was a fun byproduct), it was always to just work on what I knew was going to make me dominantly successful in performance, command. Not just any type of command, true command, commanding locations. I trained tirelessly, endlessly it seemed, working on my command, enough to where it turned into a SYSTEM. I worked hard to develop a quality slider, later identified as a slurve by most scouting departments due to its pitch design featuring depth (late break) as well as amount of movement. That pitch alone would still never be enough. The development of true command of 3 pitches is what gave me my hope to reach my goals. Everyone hits a cap, even Chapman. I reached hard velocity limits with my size and build, even still doing extensive programs, nutrition, and strength to help build as much as I could. 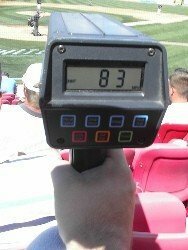 In HS, I was able to muster up a top speed of 80mph at 145 pounds, from a lower arm slot. I attribute most of my velocity increase to the amount of command training I was putting on myself, as well as frequent long toss, burnout, and wall ball (5 oz). It doesn’t sound like much, but I had true command of three pitches. I would always tell myself, even most MLB pitchers don’t have true command of 3 pitches. I can do it better. Location can dominate, at a relevant velocity. I also understood the effects of a fastball changing relatives speeds. Although for the entirety of my career I had never studied Perry Husbands work on effective velocity, I always understood how location of my pitches created different perceptions of speed, which I coined as relative speed. My effectively located 80mph fastball could look as fast as 86 while as slow as 74. That’s a 12 mph perceived spread without even actually throwing an off-speed pitch. Think. Understanding this perception can build great confidence in what it truly means to command your pitches, and how powerful a skill it can be in competition. Perry’s extensive research had confirmed my methods over the years, and given it a true metric of perception. Understanding it isn’t enough however, executing it is the key. To be clear, when I reference true command, I mean I was typically operating at a 70% margin with 3 pitches to precise locations. I still made mistakes, and recognized I still get away with some just as anyone else would. Other times I would not, as goes the game. The difference in me was my mentality. 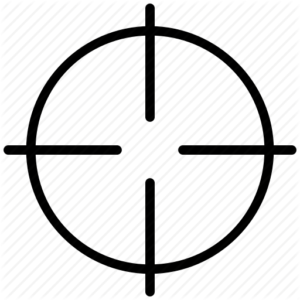 Missing my intended target was unacceptable (practice and games). Some may not handle that type of self pressure to put on yourself, but for me, my mentality was visible in how I worked on the pitcher’s mound, and it drove me to consistently strive for perfection in making adjustments pitch to pitch. If there were to be a MLB pitcher at a slower speed, it would need perfection, so I trained for execution of precision. Logic. How are you formulating decisions? I committed to my process, because I knew I didn’t have the body type while also discovering I wasn’t gifted to be the velocity elite, at the age I needed to have it by. I was keen on making logical, wise decisions. I trained to command in order to dominate, and give myself chances to further my career and continue to work on building my velocity. After spending parts of TWO YEARS in HS (Junior and Senior) reaching the command goals that were necessary to execute at a 70% margin with three pitches to effective locations, I spent the rest of my career working on velocity. Essentially all of college (Division 1 at age 17) and professional I worked to gain as much as I could, never at the cost of in game performance,or my command work. I was able to slowly stack velocity on my ability to command eventually reaching and topping at 89mph still from lower arm slot within professional games by the end of my career (age 26), ironically when I was released. My stature had only changed slightly to 5’11 175 pounds, still with professional grade strength training, nutrition, and supplements. You can give up, or educate yourself on commanding locations. When the cards are stacked against you, and you are told it’s impossible to get a chance in your current state, you are forced to find alternative ways to reach your goals. I’m going to be the first to tell you, choosing command without velocity is NOT the easy way. In fact, it is the impossible way. Yet, I would always trust the words I heard so many times in HS. “If you are good, they will find you”. My goal wasn’t to be good, it was to be incredible. Something of absolute necessity to have someone find you without velocity. Superior command, intelligence in how to get people out, can create something pretty incredible. I would later find this to be true. If you want to play at higher levels, you must DOMINATE the level you are currently playing. A true evaluation of self and performance is necessary for many to realize what needs to be done. I, like many, would have been a forgotten pitcher, due to a single metric. 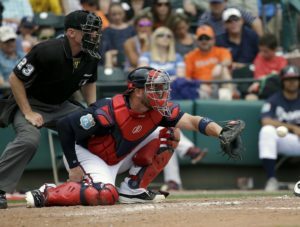 My best advice for my slow throwers who want to play in the MLB – throw harder, and if you can’t, you may want to set more realistic goals for your baseball career…If you throw slow, you gotta work 10 times harder than the ones who don’t throw “slow”, competing against the physically gifted, and the ones who are mindlessly and aimlessly training to just acquire a higher MPH; you most likely still won’t be given a chance or acknowledged. That doesn’t mean you aren’t better than others from a performance standpoint, it means you aren’t going to be given a chance (which is absurd – but a reality). Be ready to deal with consistent rejection. If you’ve hit hard limits on velocity, and you’ve committed to the command lifestyle, keep your nose down, dig in, be proud of your decision to be a success, trust the process you’ve laid out for yourself, and continue working toward your velocity goals. You might just then be able to look back at whatever career you’ve had and see success, even if it’s just high school. Fortunately for me, it was an extensive career. Many will never understand a player reaching HARD LIMITS on physicality and ability with no other options or ways to advance in this game of baseball. I dealt with it head on, weighted my options, made relate-able decisions, stared impossible in the face, and worked, worked, worked, worked, worked to dominate my competition. I had an impossible career. Can you?